Classic ballgame snacks & local flavors to keep you fueled through the seventh inning stretch. The national pastime never looked so good. The best views of the Fisher Cats are right here. Live music, tastings, events and more. A whole new meaning to "take me out to the ball game." We had a dream to combine the best in local food, drinks, and events in one amazing setting. The result: an all-new and endlessly enjoyable way to spend an evening, right here in the heart of the Queen City. 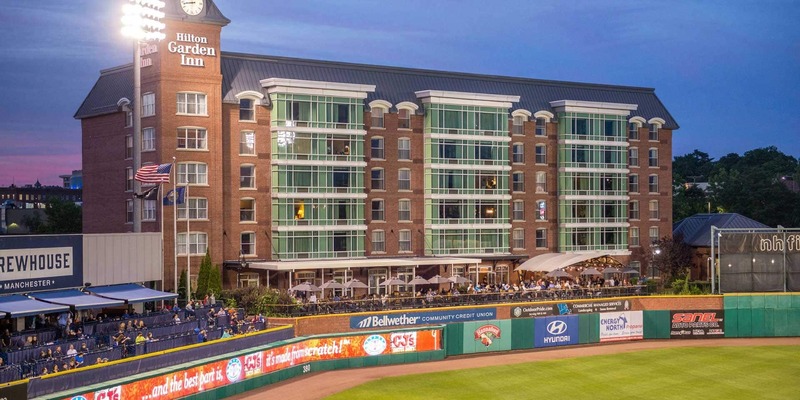 Boasting the best view in town from our spot overlooking the Fisher Cats ballpark, The Patio is worth a drive from anywhere. Turn Your Private Event Into A Home Run. Our 3 private events spaces are the perfect venue for your next event. Get in touch to learn more! From shareable snacks to full meals for the family, we're adding our own local flavor to classic ballpark eats. Kids eat free on Sundays (one child per one adult purchase of $20 or more). *Consuming raw or undercooked meats, poultry, seafood or eggs may increase your risk of foodborne illness, especially if you have certain medical conditions. Please note that some of our dishes may contain traces of nuts. For guests with special dietary requirements or allergies who may wish to know about the food ingredients used, please ask your server. Craft beer, elegant wines, cocktails, and even martinis — a step above your average ballgame beverage. When the team's away, we're still here to play. Come join us! New events posted frequently. Valet parking is now available for diners on game days! © 2019 The Patio. All Rights Reserved.